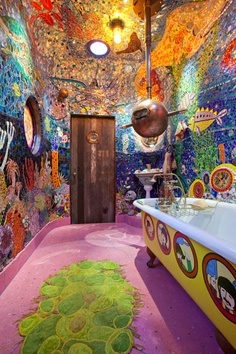 RETRO KIMMER'S BLOG: YELLOW SUBMARINE BATHROOM AND MORE !! Granny’s Grannyboot is a house that features rooms designed and worked on by various artists. Each room has a particular theme and look where the artists are free to run wild. This particular room, the bathroom is entitled the ‘Gaudi Submarine’. The Yellow Submarine Crash-Lands on Gaudi’s Beach House in “Brazil” (the Movie). Jason mecier, Christine Shield, Kate Fenker, Jenny B..,Patrick Kadyk, Keith Aderholdt, Michael Brown, Geoff Arko, and Yoram Meroz have all contributed to the unstoppable madness. Geoff Arko created the porthole windows. Light design, featuring fiber optics, by Jenny B. of Shady Lady Lighting.